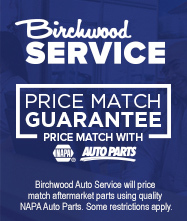 To prove that we offer better service, at a better price, guaranteed, we’ve introduced the Birchwood Service Price Match Guarantee. We’ll price match any service quote in the city with quality Napa Auto Parts. Talk to a service advisor about our Price Match Guarantee!